Let me start by saying that the products featured in this post were provided to me free of charge courtesy of Gourmet Nuts. This post may have affiliate links but this in no way will influence the review to follow and all opinions are my own. I am a simple girl, and because of this it has never dawned on me that salt comes in flavors and varieties. I have only ever used the salt that you purchase for about a a dollar at the store. As I venture further into cooking, I am learning the value of different flavors and the distinctions between different salts. I have learned that cooking is the not only the proper allocation of heat but the correct application of spices. The most simple and easiest to use seasoning is salt and pepper, and the many variations of those. The simple table salt that you purchase for a dollar is simple on taste but low on flavor and I believe the key is to pack as much flavor as possible in each used seasoning. Not to long ago I reviewed Gourmet Nuts nuts and snack products, and I discovered that they not only make nut and snack products but they have a variety of salts available. Gourmet Nut was generous enough to sent me the Himalayan Pink Salt and the Northwest Alderwood Smoked Sea Salt to sample, each of which are gluten-free. These salts come with a built-in grinder for ease of use and are simple to use. Himalayan Pink Salt: This is a pure and hand-mined salt that located and found in the Himalayan Mountains. Due to the pristine conditions of the mountains, these are clean salt crystals that are of a “Gourmet Food Grade” which means that this is a higher quality of salt then the typical table salts. The Himalayan Pink Salt is the perfect salt for cooking, seasoning, roasting and grilling. This is going to be the standard salt for use in our home and I can not imagine going back to regular use of table salt. 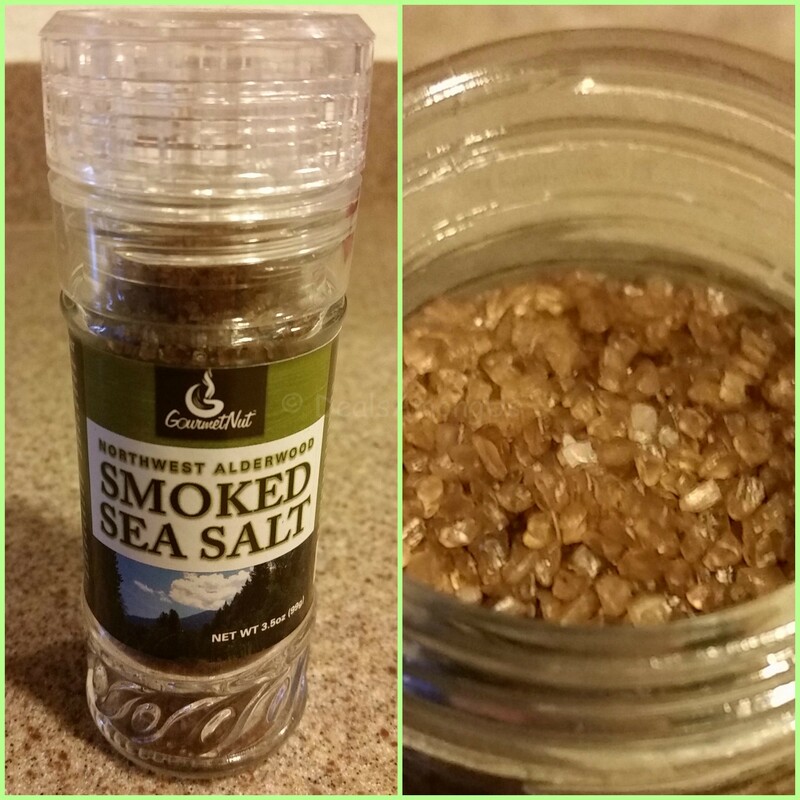 Northwest Alderwood Smoked Sea Salt: The first thing I noticed was how good this salt smelled – the smoked smell was beyond anything I have ever smelled. This is a Pacific Sea Salt that is slow smoked over real Alderwood. Alderwood is less expensive alternative to cherry wood, therefore making it a desirable wood to burn. This unique flavor of smoking in addition to the salt results in a rich salt that can be used on anything from steak, seafood and anything else you can think of. Each of these salts serve a unique flavor profile that enhances almost any meal you chose to pair them with. 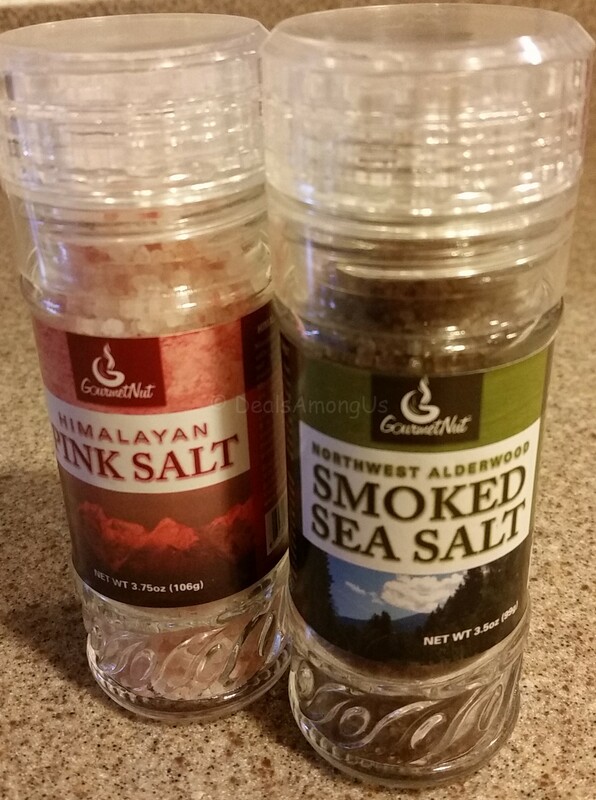 I would recommend if you have never tried a smoked salt, giving this Northwest Alderwood Smoked Sea Salt a try as well as the Himalayan Pink Salt. GIVEAWAY: Gourmet Nut is offering a 2 pack salt assortment to my readers! (1) lucky winner will be selected at random to win 1 grinder each of Himalayan Pink Salt and Northwest Alderwood Smoked Sea Salt. I will be randomly choosing 1 person on November 23 (11/23/2015) to receive this smoked salty assortment! Open to residents in the US only. To enter complete the entries below! Winner will be notified by me by email and prize will be fulfilled by Gourmet Nut! Remember you have 48 hours to claim prize, or I will choose another winner. GOOD LUCK!!! Win 2 gourmet salts from Gourmet Nuts! This entry was posted in Food and Drink Products, Giveaways, Gluten-Free, Reviews and tagged cooking, Gluten free, product review, salts, spices on October 22, 2015 by Jennifer. I like the Sel Gris French salt. I have not yet tried any gourmet salt at all. I do get sea salt, but it’s just plain salt. I would be interested in trying the smoked salt, bet that would become a favorite. I use a lot of Garlic Sea Salt we get at The Chef Store. These sound nice! I love the flaky salt–I think the one I have is called Celtic Sea Salt. I have never tried any of the gourmet salts, but my friends rave about the Pink Sea Salt — so I want to try that. To my knowledge, I haven’t tried a gourmet sea salt. I’ve always wanted to try Himalayan pink salt. I do like the pink Himalayan salt for cooking. I do have black truffle salt that is a great way to add subtle truffle flavoring. I have never tried any, I usually just use regular sea salt. I don’t think I’ve every had a gourmet salt but am willing to try! I like the Himalayan Pink I love trying new salts & seasonings. I have never tried a gourmet sea salt but it sure sounds like something I want to try! I have not tried any gourmet salts but I would love to try some. I think I would be the most interested in trying the Pink Himalaya Salt. My favorite is smoked sea salt. Wow, this will be great for cooking! to me it definitely has a different taste…plain table salt tastes really harsh. Pink Himalayan Salt is very special.. Not just for eating, but it has medicinal values, too! My favorite gourmet salt is pink Himalayan salt. I like REAL SALT brand garlic sea salt. We love pink sea salt on pork – best combo! I love using himalayan pink salt on just about everything these days. But wow, I would certainly love to try that smoked sea salt, it sounds delicious. I like sea salt, usually sprinkled with vinegar over potato chips. Come to think of it not sure how gourmet that it. I haven’t tried any gourmet salts before but I definitely want to. I’ve also seen pyramid salt before which fascinates me. I love Pink Sea Salt. My favorite is Himalayan Pink Salt. I like the pink Himalayan salt the best. My favorite salt is the Himalayan Pink Salt. I do like Himalayan pink salt. I have seen them for sale at T.J. Maxx but never bought any. Would love exploring their flavors in different foods. Never tried it yet but am looking forward to. My favorite is Himalayan Pink Salt. Although I have never tried this brand and would like to! Thanks for the chance. I’ve never tried gourmet salt but definitely would love to. The Himilayan pink is our absolute favorite, we found them when my daughter worked at TJ Maxx/HomeGoods and have been hooked ever since. my favorite is definatly the Pink Sea Salt. 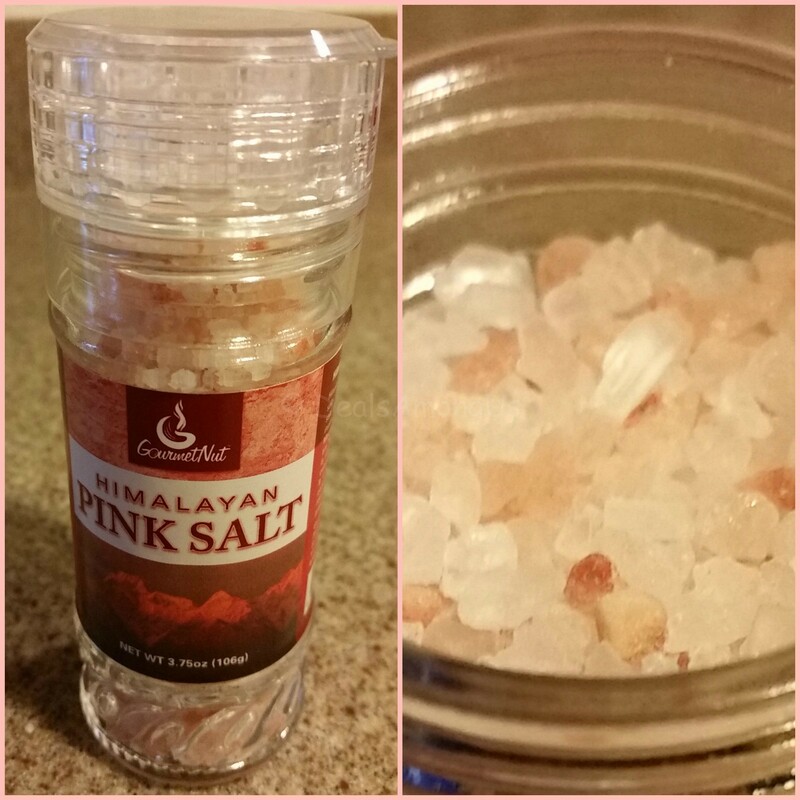 I love the Himalayan pink sea salt I use it daily! Lately, I am loving Himalayan Pink Salt.